Xiaomi Black Shark Phone with Snapdragon 855 Likely to Debut in March or April - Playfuldroid! During the weekend, Xiaomi CEO Lei Jun asked Black Shark fans to share their expectations and suggestions to the Black Shark team. The Weibo post was reposted by Xiaomi’s Product Director Wang Teng Thomas along with his own replay saying that yesterday he saw a new Black Shark smartphone and found it to be “very cool.” This indicates that the company is now prepping up to introduce a new gaming. The first Black Shark phone was introduced in April. Hence, it is likely that the company may debut its successor by the next month or April. 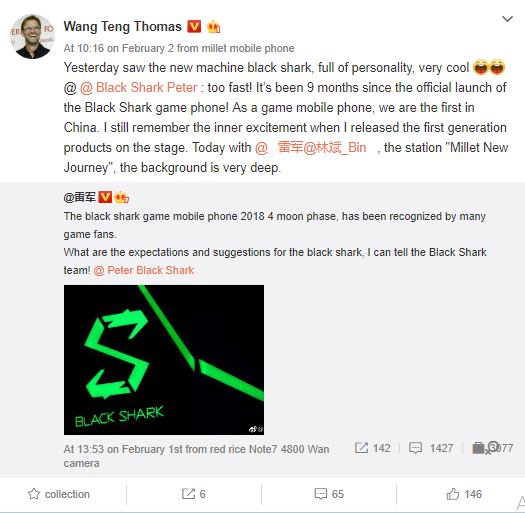 Wang Teng Thomas has not shared any information on the specifications of the upcoming Black Shark gaming phone. At the beginning of this year, a device named as Xiaomi Black Shark Skywalker had appeared on Geekbench with Snapdragon 855 chipset and 8 GB of RAM. It was loaded with Android 9 Pie OS. The smartphone had recorded impressive 3494 single-core and 11,149 multi-core scores on the benchmarking platform.